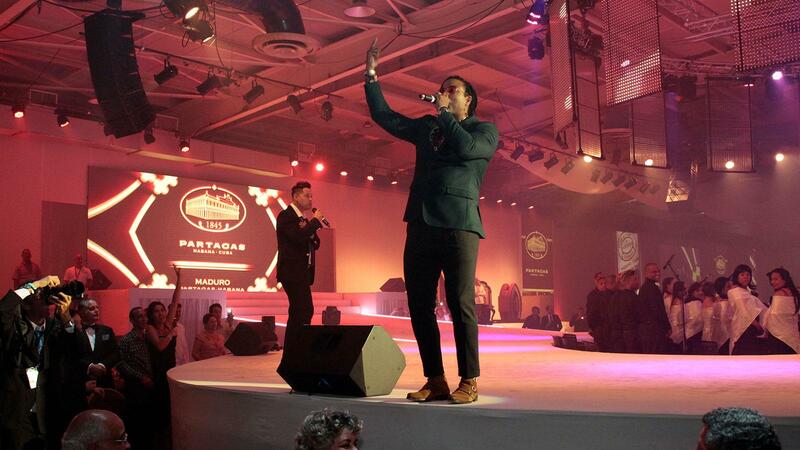 The Friday night gala dinner at the Festival del Habanos featured live entertainment by Cuba’s leading dance troupes. When the golden chaveta, a Cuban style gavel fashioned after a rolling room knife, hit the podium for the last time, the live auction closing the Friday night gala dinner at the Festival del Habanos had raised 1.485 million euros ($1.8 million). The auction, which consisted of seven custom-made humidors, each brimming with Cuban cigars, raised money for Cuba’s public health system. The evening’s rollicking entertainment began as the doors opened into a room nearly 400 feet long bedecked with ceiling-to-floor posters of the star cigar of the night, the Partagás Linea Maduro series. There were close to three hours of performances by Cuba’s leading dance troupes, backed by the National Radio and Television Orchestra, outstanding musical acts by Pedrito Calvo and others and a grand finale staged by the famous Cuban vocal group, Orishas, who brought the house down at the end of the evening with a rap laced, melodic anthology of their greatest hits. The cigar lineup for the night included the Partagás Linea Maduro No. 1, a current production, 5 inch long robusto with a 52 ring gauge. It was followed by a pair of new releases, cigars that won’t go on sale for quite some time, the Partagás Linea Maduro No. 3, a 5 3/4 by 50 cigar and a Partagás Linea Maduro No. 2, a short, 4 3/4 by 55 pyramid. The evening’s final cigar was a Partagás Lusitania, one of Cuba’s iconic double coronas, a big, fat smoke measuring 7 1/2 by 49 (and also Cigar Aficionado’s No. 11 cigar of 2017). The guests—the women decked out in flowing gowns, kimonos and fancy cocktail dresses and the men in everything from slick tuxedos, to Japanese and Chinese traditional garb to dressy Latin-style guayaberas—were handed a rose and a Partagás Serie D No. 6, as they entered the hall. The top-selling lot was a whimsical humidor for the Cohiba brand, which went for 340,000 euros ($418,000). The winning bidder was Hamed Abouzahr, a Lebanese Peruvian who distributes Habanos cigars in Peru, Bolivia and Ecuador. The humidor was shaped like a burning Cohiba cigar topped with a sculpture by a famed Cuban artist, Roberto Fabelo. It came filled with 550 cigars, including a full selection of Cohiba Behike BHKs, Maravillas, Talismáns, 1966s and the full Siglo range. The famous Cuban vocal group Orishas brought the house down at the end of the evening with a rap laced, melodic anthology of their greatest hits. The biggest buyer was Hamad Al-Shamisi of Dubai who purchased three of the six humidors for a total outlay of 610,000 euros ($750,000). His three consisted of a Hoyo de Monterrey humidor with 370 cigars, a Romeo y Julieta humidor with 400 cigars and an elegant, modern Montecristo humidor with 445 cigars. Badar Zeidan from Lebanon, of the Phoenicia cigar company, the most important distributor of Cuban cigars in the Mediterranean and the Middle East, bought an H. Upmann humidor for 100,000 euros ($123,000). The stunning tobacco leaf shaped design contained 350 cigars included the Sir Winston, the entire line of Magnum cigars and the big Tacos Imperiales. Alex Wong of Hong Kong was the second-biggest buyer of the night, purchasing a Partagás Humidor for 250,000 euros ($308,000). That piece came filled with 420 cigars, highlighted by 20 Partagás Salomones, 20 Sobresalientes, 20 Lusitanias and 20 cigars in the classic 109 shape, a Double Corona with a figurado head. Wong also scored the winning bid in a separate silent auction that was conducted all week long for Habanos distributors, with a bid of 82,000 euros ($101,000) for a special humidor containing 150 cigars consisting of each of Cuba’s iconic global brands—H. Upmann, Montecristo, Romeo y Julieta, Hoyo de Monterrey, Partagas, and Cohiba—plus a special addition of the luxury Cohiba brand extension, Behike. Each cigar carried a special 20th anniversary band, commemorating the Festival’s 20th year in 2018. The other humidor was purchased by Reza Valibaouch, a Belgian cigar merchant; he won the El Rey del Mundo humidor, which held 350 cigars, including sizes rarely seen today, Tainos and the 2017 Imperios.